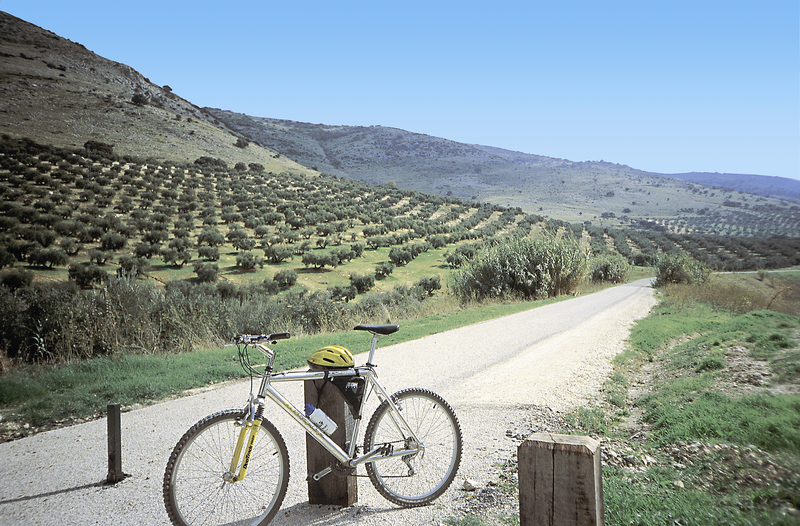 An endless coverage of olive trees, along with 13 metal viaducts impressive nineteenth century, are the main hallmarks of the 128 km route in the provinces of Jaén and Córdoba. On this point tapestry, a closed rail has been recovered as a green route to enjoy an area of attractive scenery and a rich legacy of history. This Vía Verde is the longest one of Andalucía. Municipalities: Jaén, Torre del Campo, Torredonjimeno, Martos, Alcaudete, in Jaén; Luque, Baena, Zuheros, Doña Mencía, Cabra, Lucena, Moriles, Aguilar de la Frontera and Puente Genil in Córdoba. Suitable and accessible with some sections tilt. Natural landscape: Betica ranges. Natural Reserve Laguna Honda. Natural Reserve Laguna del Salobral. Subbetica Natural Park. Bat Cave Zuheros. 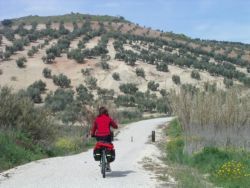 Spur to Baena: olive grove. Cultural heritage: Jaén Monumental set. Alcaudete Medieval Castle. Viboras Medieval Bridge. Archeologic route of los Torreones. Town centres of Luque, Zuheros, Donna Mencia, Cabra and Lucena. Bat Cave Zuheros. Infrastructure: Vía Verde, 12 estations, 4 túnnels, (one is actually a road underpass),13 metal bridges/viaducts and 7 pedestrian footbridges. Infrastructure Equipments: 45 rest areas, 13 parking areas, 5 sources of water (Martos, Torredelcampo, Luque, Cabra y Navas del Serpillar (2)). In Jaén: Torredelcampo, Torredonjimeno, Vadojaén y Alcaudete Stations restored as rest areas. - Casilla de la Cruz Blanca: Museum. - Doña Mencía Stations: bar - restaurant. BTT Centre. Bike rent. Caravan area. Access no. 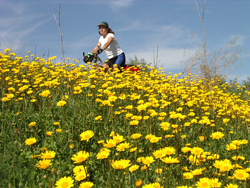 1: At the start of the greenway, to the west of the city of Jaén, next to the Las Fuentezuelas sports centre. There, at the end of the Ronda Juez Juan Ruiz Rico, is where the greenway begins. GPS coordinates (decimal format): 37.785326°, -3.811923°. Access no. 2: In Torredelcampo, near the roundabout at the entrance to the town on the JA-3401 road, not far from the municipal cemetery. GPS coordinates (decimal format): 37.778750°, -3.896578°. Access no. 3: In Torredelcampo, where it crosses Paseo de la Estación street. GPS coordinates (decimal format): 37.774697°, -3.902876°. Access no. 4: At the old station of Torredonjimeno, now refurbished as a rest area for the greenway, complete with parking facilities, located near the entrance to the town from the A-316 motorway. GPS coordinates (decimal format): 37.759778°, -3.945521°. Access no. 5: In the town of Martos, where it crosses the J-213 road. GPS coordinates (decimal format): 37.724227°, -3.976007°. Access no. 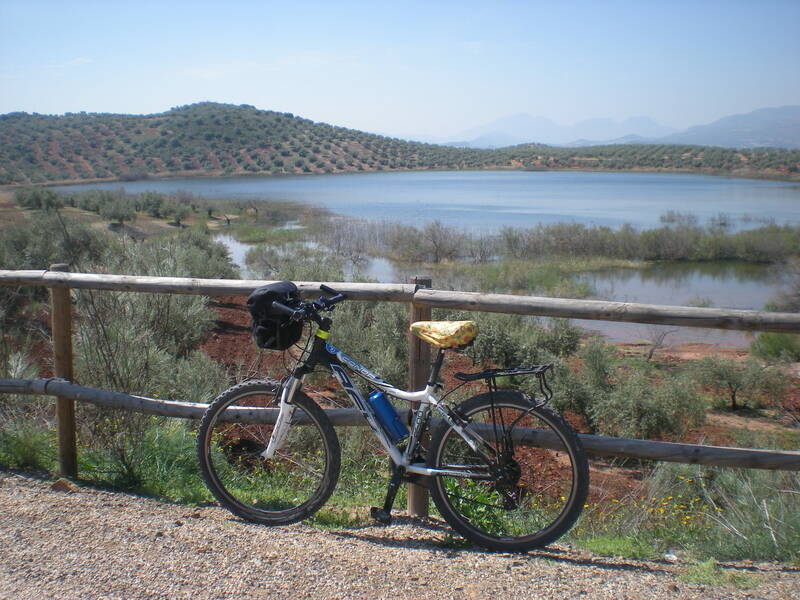 6: In Martos, at the town’s rest area (where there is a car park), close to where the greenway crosses the west entrance to Martos (exit no. 81) from the A-316 motorway. 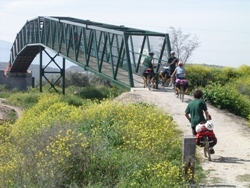 It is also possible to join the greenway in Martos on the stretch which has been developed as a central promenade of the avenue leading to the ruins of the town’s old station. Parking is available along the avenue itself. GPS coordinates (decimal format): 37.722296°, -3.974935°. Access no. 7: At the old station of Vado-Jaén, now converted into a greenway rest area (complete with parking spaces), located next to the JA -3307 road which links the A-316 road with the village of Las Casillas. GPS coordinates (decimal format): 37.666919°, -4.038216°. Access no. 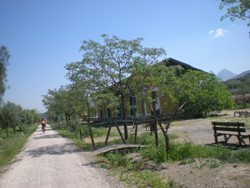 8: At the old station of Alcaudete (refurbished as a greenway rest area complete with parking spaces) with access from the roads A-316 and JA-4308, the latter of which links the former with the town centre of Alcaudete. Access no. 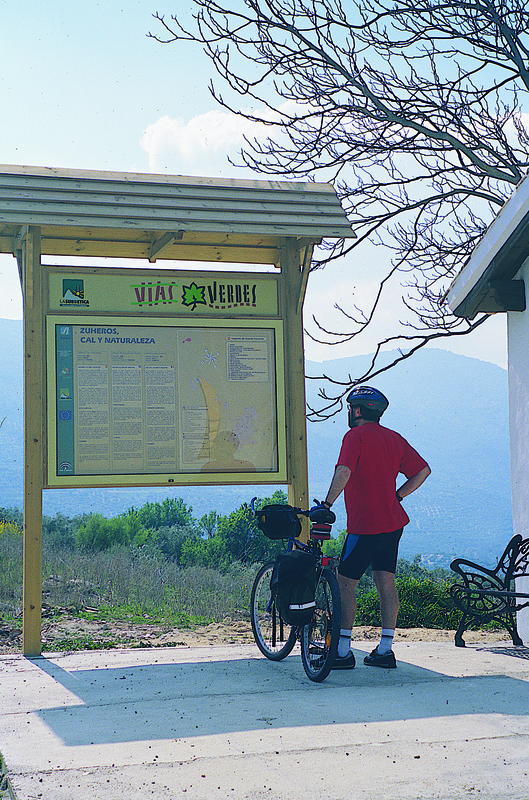 9: At the old station of Vado-Jaén, now converted into a greenway rest area (complete with parking spaces), located next to the JA -3307 road which links the A-316 road with the village of Las Casillas. Access no. 10: At the old station of Alcaudete (refurbished as a greenway rest area complete with parking spaces) with access from the roads A-316 and JA-4308, the latter of which links the former with the town centre of Alcaudete. Access no. 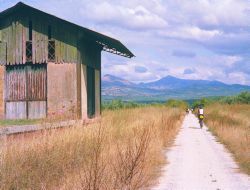 12: At the old station of Luque, close to the N-432 road. GPS coordinates (decimal format): 37.572842°, -4.263011°. Access no. 14: At the old railway station of Doña Mencía, at the entrance to the village of the same name via the A-318. GPS coordinates (decimal format): 37.545804°, -4.357004°. Access no. 15: At the old station of Cabra, in the heart of the town itself. GPS coordinates (decimal format): 37.474739°, -4.423918°. Access no. 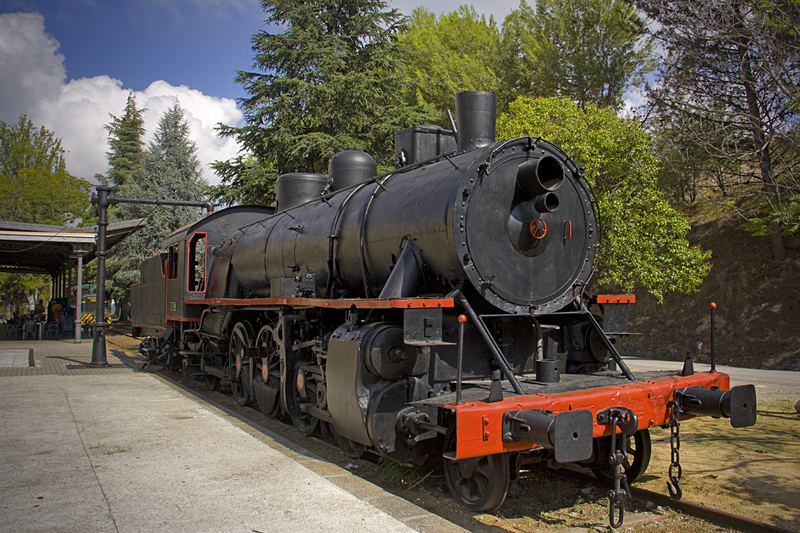 17: At the old railway station of Lucena, close to the A-339 and the N-331 Cordoba-Malaga road. GPS coordinates (decimal format): 37.416655°, -4.496145°. Access no. 18: At the old station of Moriles-Navas, in the village of Navas del Selpillar. Access no. 19: At the old station of Camporreal; take the Puente Genil exit off the A-318 and then follow the CO-6223 road. GPS coordinates (decimal format): 37.401436°, -4.709966°. 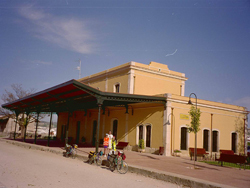 In nearly all cases the old stations along the railway line have been converted into rest areas with eating and drinking facilities, except for the access at the Moriles- Navas del Selpillar station which is now home to the Enogastronomic Interpretation Centre of the Montilla-Moriles Wine Route. Access no. 5: Where the greenway crosses the track from Martos, at Km 20.4 of the greenway. GPS coordinates (decimal format): 37.737357°, -3.964736°. Access no. 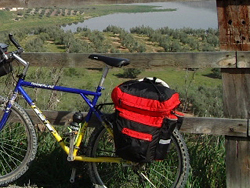 8: Where the greenway crosses the Ayozos track from Martos, at Km 27.250 of the greenway. GPS coordinates (decimal format): 37.708467°, -4.005913°. Access no. 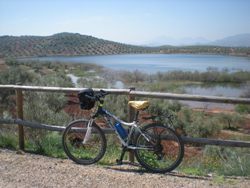 11: Where the greenway crosses the road from the N-432 to the village of Albendín, next to the Laguna del Salobral lake. GPS coordinates (decimal format): 37.581268°, -4.214264°. Access no. 13: At the level crossing where the greenway crosses the road to Zuheros, next to the guard house. Access no. 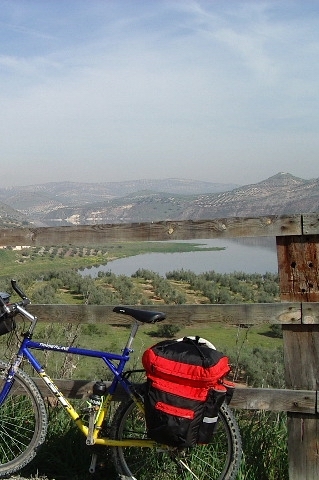 16: At the exit from Cabra, after the greenway bridge over the road leading to the Virgen de la Sierra Sanctuary. Although it is signposted as “Disabled access” and fitted with ramps, the start of the route is very steep and the surface is bad, due to the fact that the access is in an unsurfaced car park area. GPS coordinates (decimal format): 37.466381°, -4.422317°. 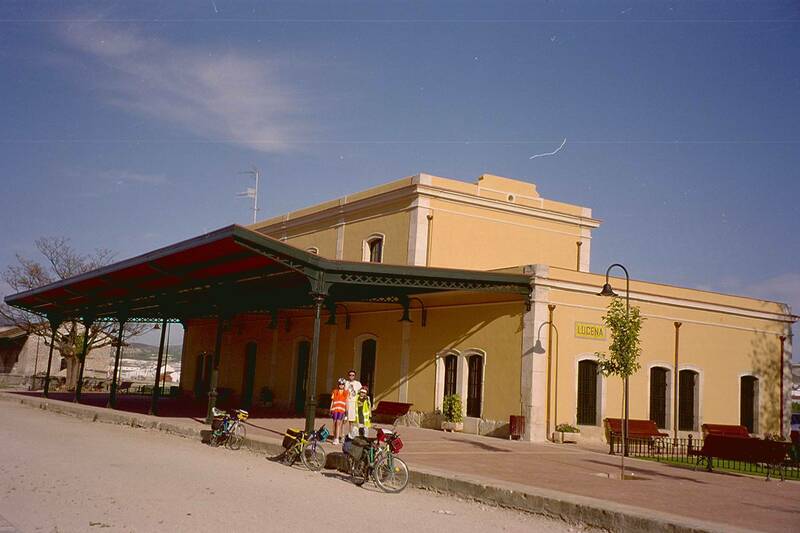 Jaén Railway Station. ADIF. Telf. 953 270 202 - 902 24 02 02. Puente Genil-Herrera Railway Station. AVE (High speed trains). ADIF. (*) Consult the rules for taking bikes on trains. -Line M2 - 1 Jaén – Torre del Campo, Torredonjimeno and Martos. - Line Jaén-Alcaudete: Transportes Ureña S.A.
-Lines from Córdoba to all the province: Autobús Carrera S.L. Lines from Córdoba to Luque and Baena. Autobús Carrera S.L. 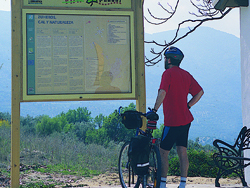 The Greenway sets out from the city of Jaén. The actual starting point is in the west of the city at the Fuentezuelas sports centre, situated at the end of the Ronda Juez Juan Ruiz. The first part of the route runs parallel to the active railway line that leads to Espeluy. After some 1,500m we part company with the Renfe railway line and start the climb towards Martos, tracing an arc that skirts the steep foothills of the Sierra de la Grana, crowned by the Jabalcuz mountains. In the future access to oil Greenway will be even easier and safer. A bike path, developed by the Ministry of Environment of the Junta de Andalucía and the city of Jaén, respectively, will give riders a continuous walk out of Jaén and connect with the Greenway. 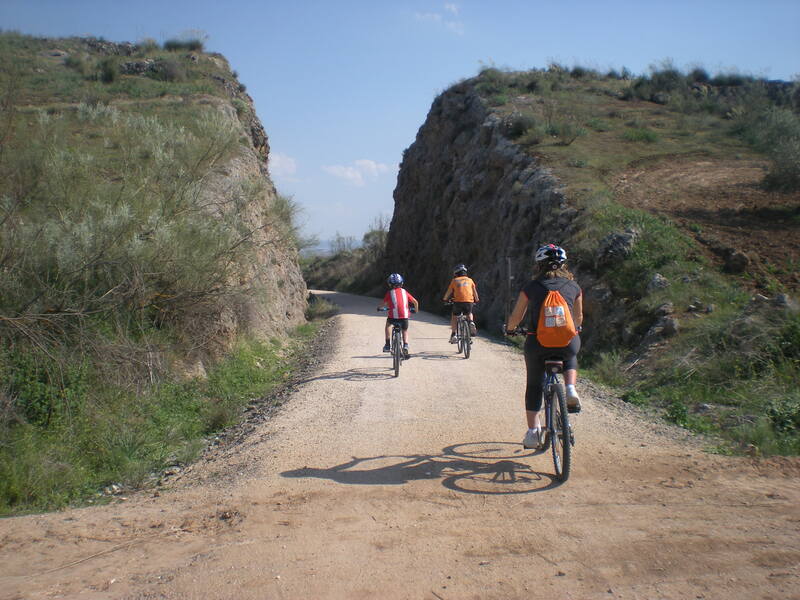 The bike line, 3.2 km, will run through the streets of Andalusia and Arjona and Bath Street The Fuentezuelas, linking the city center with the sports of The Fuentezuelas and Via Verde. 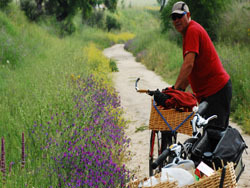 About two kilometres from the starting point the former railway line has been swallowed up by the Jaen ring motorway, but a nearby underpass and some rural paths take us to the first station, Torredelcampo. But before we reach the station, at km 6.3 we will have the chance to get our strength back at a fountain at the crossroads with the track from Jaén to Torredonjimeno. 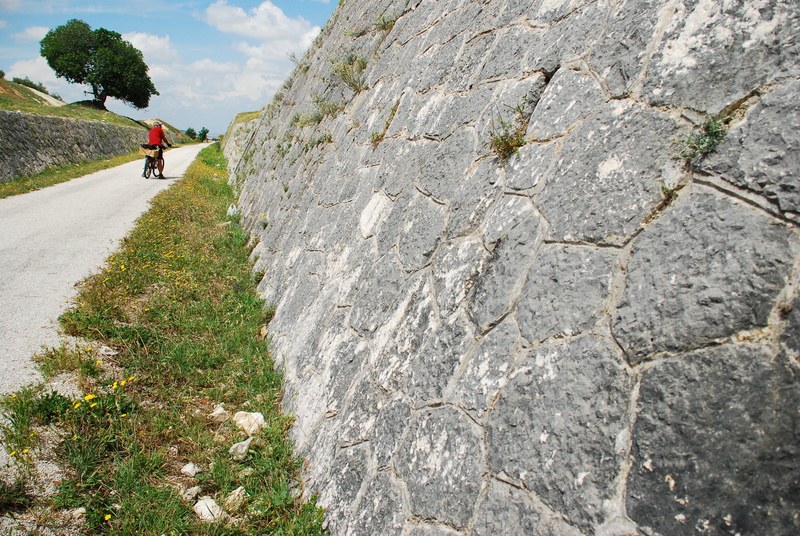 This track offers an alternative route to our Greenway as it forms part of the Los Torreones archaeological trail. In this area our view to right and left is punctuated by a succession of cortijos, the production centres of the olive groves that dominate the landscape. We continue our gradual climb up to km 8.8 and the ruins of the Moralduro loading platform and sidings which used to serve trains carrying gypsum from the nearby quarry. Some 500m from Moralduro we see how roads have once again been built over the old railway route. Now we need to cross the A-316 motorway. No problem! A brand new 73 metre long footbridge spanning the road allows walkers and cyclists to reach the station safely and effortlessly. 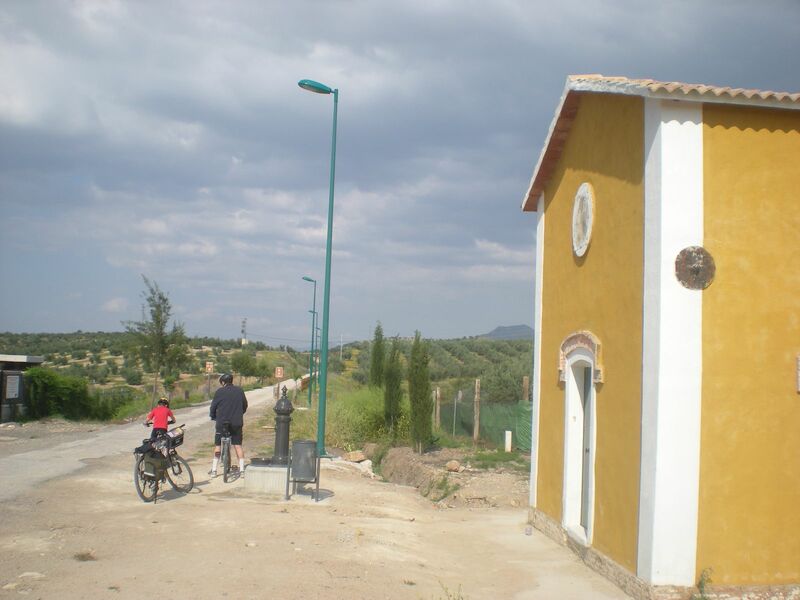 Torredelcampo station, 11 km from our starting point, has a water fountain and is the first large station on our route. After the requisite stop at the village, we take our leave of the station via the Caballico tunnel. The 333m long, curved tunnel is illuminated to ensure our safe passage. Soon after the tunnel comes the first metal bridge on the route and where our safe crossing is assured by a new surface made of railway sleepers. 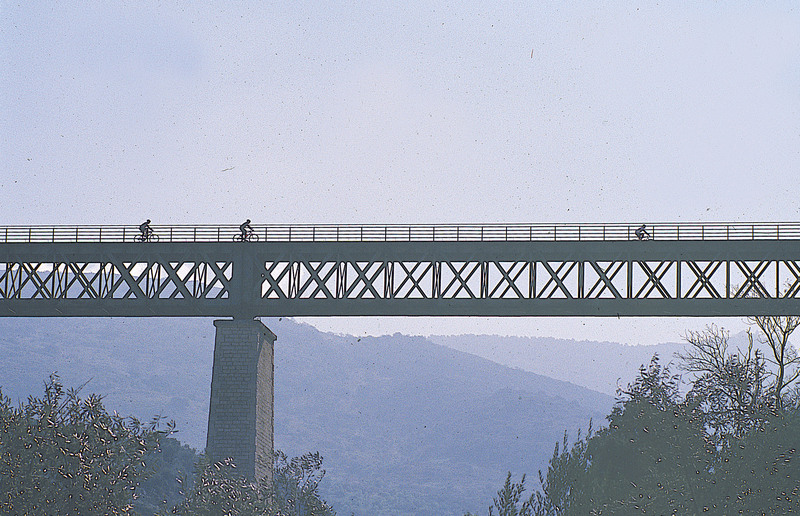 Located at km 12, the Piedra del Águila bridge has a span of 104m over the stream that gives it its name. Resting on two stone columns, its rusted iron lattice stands proud over the surrounding sea of olive trees. 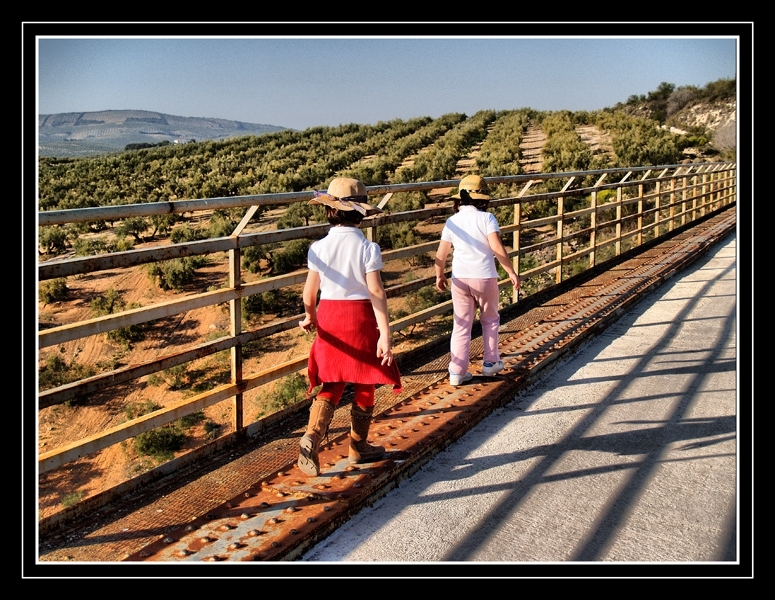 About a kilometre further on, after a splendid view over the endless olive groves and after crossing another, less spectacular, iron viaduct, we approach our stopping place: Torredonjimeno. Before we arrive we need to negotiate another underground passageway. This tunnel (the last on the route) is around 120m long and leads us to the outskirts of Torredonjimeno. After an overpass over the N-321 we arrive at Torredonjimeno station (Km 15.2). From Torredonjimeno our route winds upwards as we gradually gain height on our way to Martos. 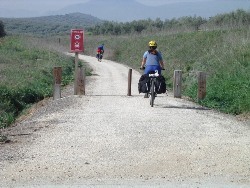 Shortly after setting out we cross the new access road to Martos from the A-316 via a recently built cycle bridge. A little while later we need to cross the A-316 yet again (for the fourth time) although in this case the Greenway drops down to a local track and makes use of an underpass. After running parallel to the railway embankment we regain the railway line at a section that takes us due south. Now we are on our way to the town centre of Martos, commanded by a height called the Peñón which towers some 350m above the city. This is the highest point of our Greenway (650m). From here we start to go down, practically continuously, until we reach the Guadajoz River, which marks the border between the two provinces. We shall make our halt in Martos in the shade of the station awning (naturally) which, like all its adjoining buildings, is in a fairly good state of preservation (km 23). And so as not to break with tradition, we leave Martos via yet another intersection with the A-316, in this case via a tunnel that avoids having to use the main road. The rest of the route is characterized by a succession of tight bends. Only the terracing and irrigation ditches dare break the perfect geometry of the olive grove. 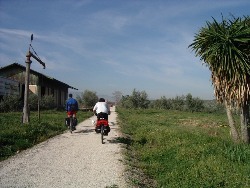 The white stain of the old gypsum quarry alongside the railway track at km 26 also breaks up the green carpet of olive trees. Three kilometres further on we come across the A-316 (no surprise here!). Once again a recently built cycle bridge takes us safely over the motorway. From here we continue our winding descent towards the Salado river, skirting the edge of the Cerro de la Capellanía. At the end of this switchback ride we reach the valley carved by the Arroyo Salado. The railway spans this stream by a 208m long metal bridge resting on two masonry columns (km 34), one of the most majestic constructions on the entire route. Little by little the rolling hills give way to escarpments as we approach the foothills of the Subbética mountain range. 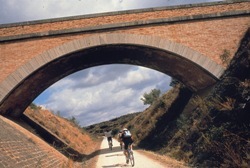 Soon we come across another spectacular viaduct, spanning the Arroyo Higueral. 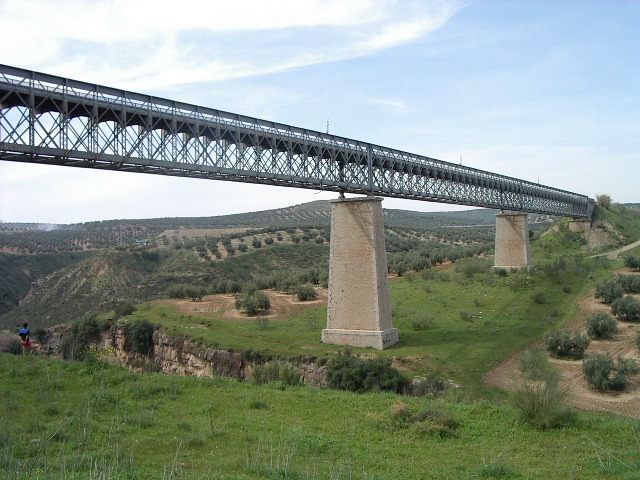 Beyond this viaduct, slightly shorter than the last (133m), lies a gentler landscape, home to the isolated station of Vado-Jaén (km 37). It is more than 7 km from the nearest township and was built to serve only as a junction station. Leaving behind Vado station we climb the gentle incline leading up from the Higueral ravine, the first upward stretch since we left Martos. 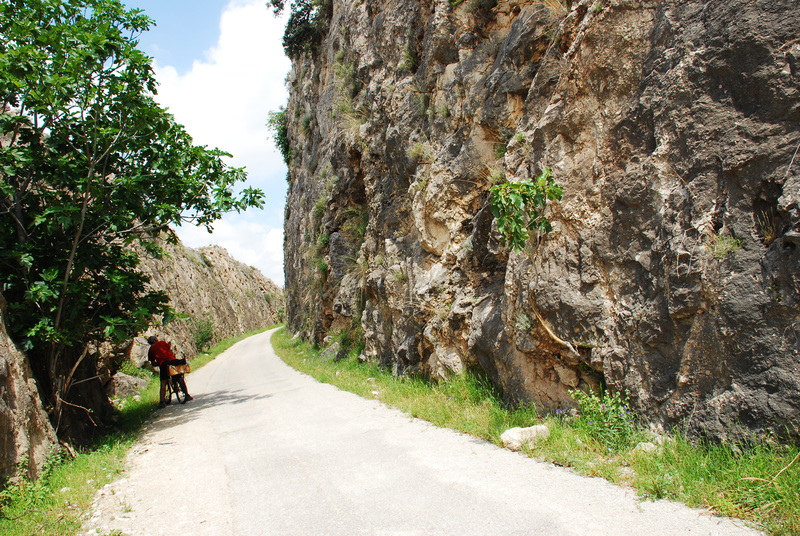 But two kilometres from Vado we start to descend again and it is all downhill now until the end of the route. 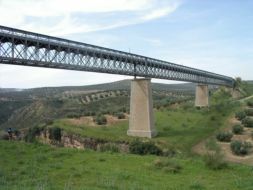 At km 42 we arrive at the point where the railway line crosses the river via another spectacular metal viaduct. The 224m long lattice bridge serves as a perfect viewing point overlooking the valley. At the foot of the viaduct there is a medieval bridge whose single round arch spans the Víboras river and provides access to an almost forgotten old pathway. 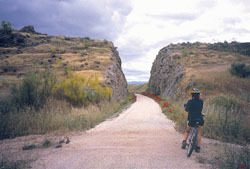 We continue downwards, shortly to pass by an abandoned railway ballast quarry, the La Muela quarry. We are still moving through broken terrain and the railway line often has to rise between the olive groves on high embankments. 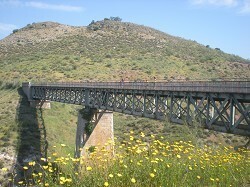 On the way to the next station, Alcaudete (whose buildings have been restored, but not for any specific tourism-related use), the Greenway makes use of two old metal railway bridges over the Chaparral and Esponela rivers. These are both 70m long, single span constructions, located at km 45 and km 46 respectively, forming part of a section of straight paths leading to Alcaudete, the last station on the route. The good news is that the station was being Alcaudete-at the end of this edition, retrieved, by the City, as a lodge and restaurant. No doubt an oasis for travelers. The town of Alcaudete with its impressive castle is some 4 km (uphill!) from this railway site, where there is a usefully placed hotel at which we can make a stopover. On the other side of the station we meet for the last time with the A-316 road. No problem! A new footbridge installed in 2018 avoids any danger. 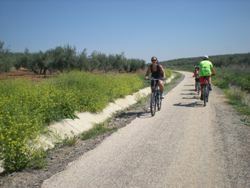 From Alcaudete station we leave behind the monotony of olive trees and travel through a more natural landscape with a light covering of Mediterranean vegetation. The natural value of the area grows as, just a little further on, we pass by the Laguna Honda Nature Reserve (km 50) on our left. 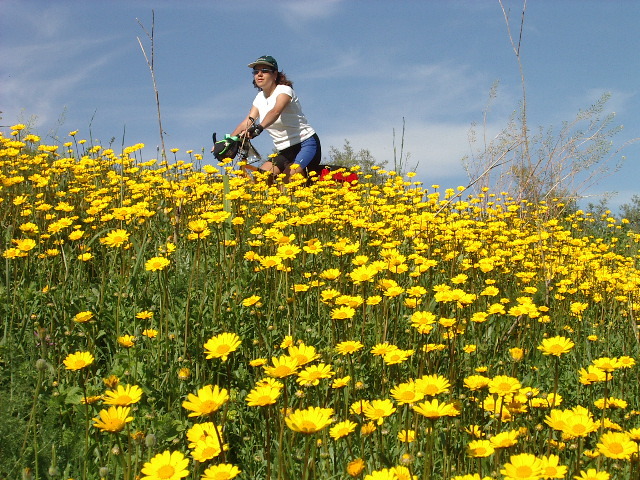 Our Greenway route affords us the best possible point from which to view this protected natural area. From here we embark the stretch of the route in the province of Jaen; three kilometres featuring two pronounced curves around the Loma de Desgarradero hill. 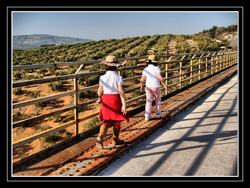 At km 52 we cross the Desgarradero ravine by a new 83m long metal bridge, a foretaste of the spectacular viaduct over the river Guadajoz. This incredible Meccano-like structure sits on two iron trestles supporting a 200m long lattice truss. The waters of the Guadajoz river have caused a great area of saltcedar to form upstream of the bridge, home to a thriving colony of birds. 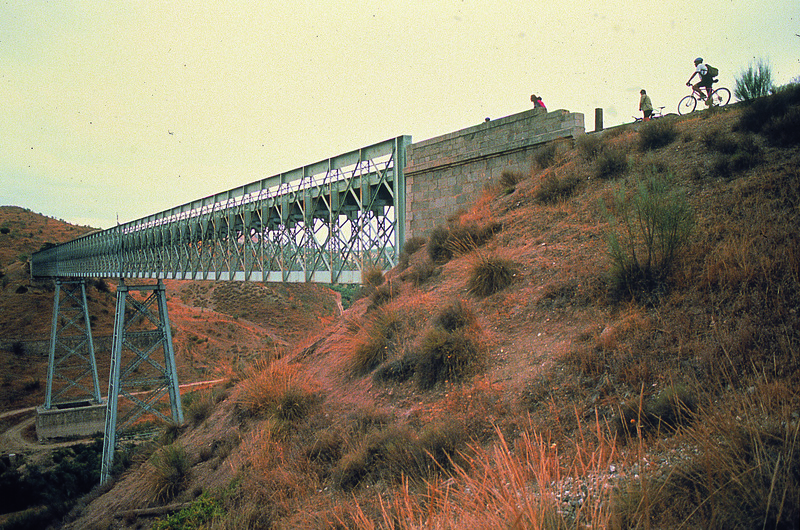 The Guadajoz river does not flow downstream of the viaduct since, in times of rain, the level of the Vadomojón reservoir reaches the very trestles of the viaduct. 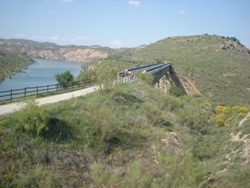 On the other side of the viaduct the route continues in the province of Córdoba to Navas del Selpillar, on a similarly prepared 58 km long greenway through the rural district of the Subbética Cordobesa. 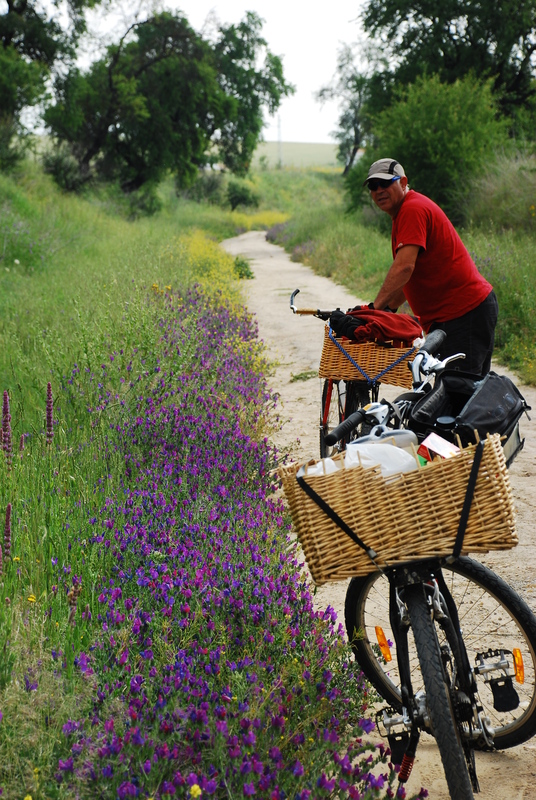 And if this were not enough, we can say that the greenways are in Jaén land a promising future. The Provincial Council and Ministry of Environmet has created two new greenways. 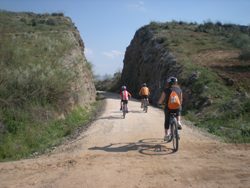 Guadalimar Greenway and Segura Greenway, 27 km, from Arroyo del Ojanco to Villarrodrigo, and soon it will be extended another 26 km to Villanueva del Arzobispo... and from there onwards into the province of Albacete. 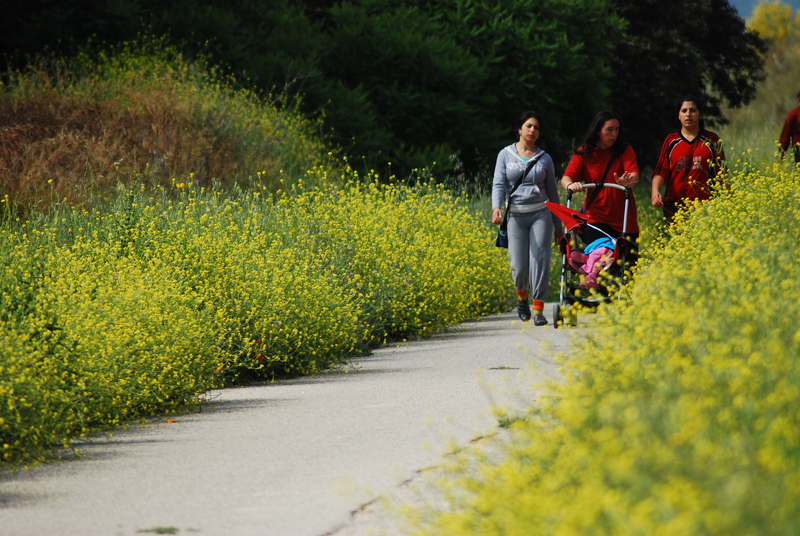 These new greenways are part of an ambitious project launched by the Diputación de Jaén. 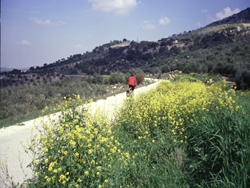 The Green Corridor Jaén integrate greenways Oil and Linares, Guadalimar Greenway, Espeluy-Linares and Segura Greenway. The result is a continuous non-motorized route of 270 km, which will cross the width across the province of Jaén, from the eastern to the western border with Albacete Córdoba. 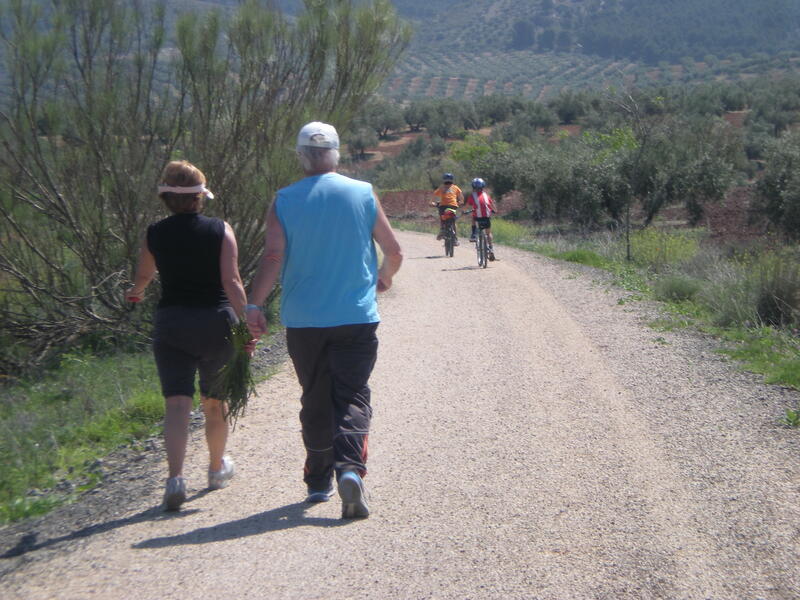 Now in the province of Cordoba in the rural district of Subbética after crossing the river we climb steadily up a gentle incline with olive groves on either side. The trail leaves the river behind and clings to the terrain in a series of sweeping curves and deep cuttings. This climb lasts for just three kilometres before we arrive at the top of a hill called Collado de las Arcas. A gentle climb around sweeping curves takes us to Luque station. An enterprising businessman has taken the old railway building over and has converted it into a restaurant and a museum with a décor based on old railway artefacts. We resume path to the following scale: Zuheros. Again on the main greenway and from here we make our way to the next stop, Zuheros, but not before climbing up to the town of Luque by a dirt track from the station to have a look round. As we exit the station, to our right a spur line branches off which will take us to the town of Baena. 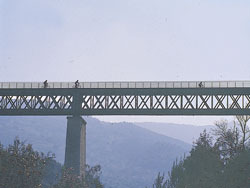 It is easy to spot due to the metal footbridge spanning the N-432 road just 250 m from the station. 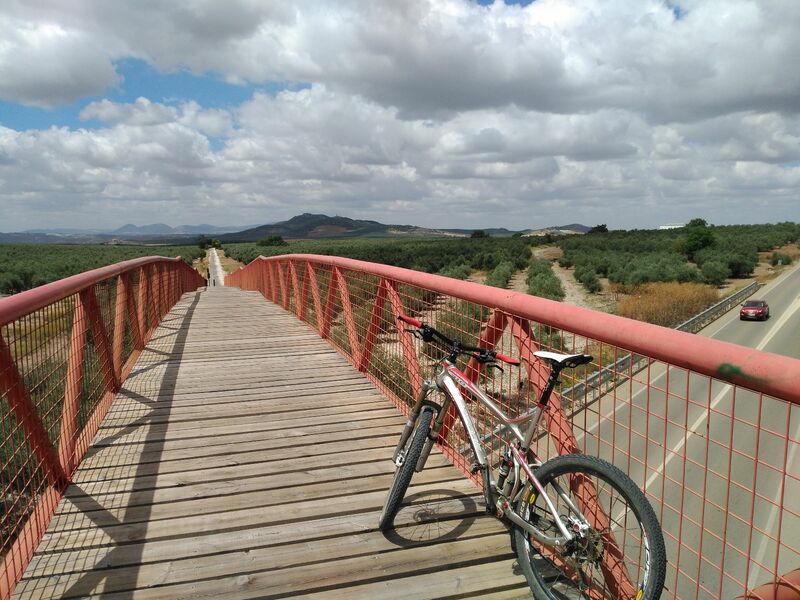 At this point one very interesting option is to visit the beautiful town of Baena via the spur of the Olive Oil Greenway which starts at Luque station. 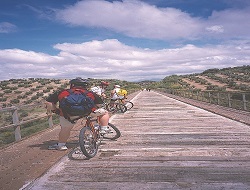 This 7.753 km stretch was opened in November 2010, linking up with the longest greenway in Andalusia. Beyond Luque Station on the right we arrive at an 83 metre long footbridge spanning the N-432 road. We continue to follow the old railway route and after a few hundred metres cross the CO-6204 road before reaching the only railway building (trackside hut) still standing today, now used as a stable for horses. We are now very close to the 6 kilometre stone. We continue along the greenway engulfed in a sea of olive trees. 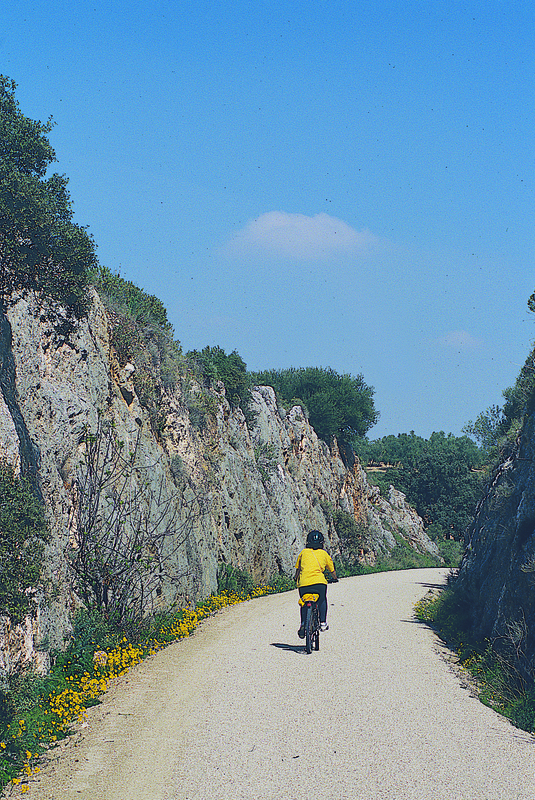 After crossing the Camino Cañada del Rosal, a country lane, the greenway continues parallel to the N-432. Soon we start a steep climb, running alongside the service road of the N-432, and reach kilometre point 3, where there is the first of the two rest areas on this greenway. This place is well worth stopping at, since it is an excellent viewpoint from which to take in the limestone peaks of the Sierras Subbéticas Natural Park, part of the World Geoparks Network, with the pretty white village of Zuheros in the distance and the fertile meadowland of the River Marbella in the foreground. After our well-earned rest we start to lose height until we reach an underpass taking us to the other side of the N-432. 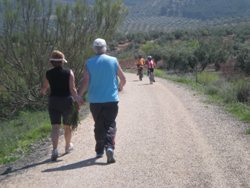 Shortly afterwards we rejoin the original rail bed after first crossing another country lane, the Camino de Mangarulejo. The greenway runs along an elevated embankment allowing us to enjoy the landscape of olive trees and, here and there, a vineyard, parallel to the old N432 road, the N-432a. We soon arrive at a restaurant and apartment complex called the “Fuente de la Salud”, another good place to stop over or have a meal at. A few minutes later and we are at the site of the old Baena railway station, now converted into a rest area and a splendid viewpoint over the beautiful town of Baena, home of the much appreciated Denominación de Origen Baena olive oil. The village itself is at a higher level than the old railway line, we can climb up a road that crosses the track at a level crossing whose gate house has been refurbished as the “Francisco Poyatos Studio Museum ", but the climb is rewarded by the chance to take a stroll around the streets of Zuheros, especially in spring when the flowers are in bloom. From the town square there is an excellent view down to our Greenway, the only flat ground in a mountainous terrain. 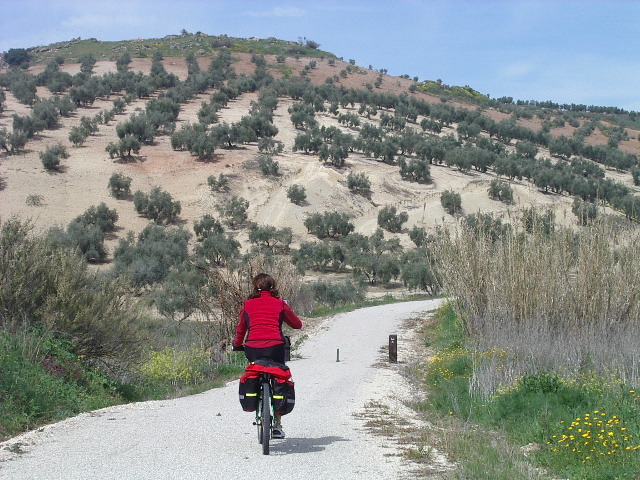 We continue between olive groves to another village clinging to a hillside, the village of Doña Mencía. Our Greenway skirts around the village before arriving at the station (Km 74,5) which, like Luque station, has also been converted into a restaurant and other tourism services, plus a caravan park. Throughout the entire route, every so often we come across railway workers ’cottages; from the one at Km 77 there offers a wonderful outlook superheat village of Doña Mencia. Furthermore, this box has been restored by the City of Dona Mencia, through the Sustainable Tourism Program of the Subbética Cordoba, to shelter in the future other tourist information. After crossing a bridge over the old Cabra road we reach the fourth and final tunnel, the only one along the route in the province of Córdoba; the 140 m long Del Plantío Tunnel. From here we begin to drop down to the town of Cabra. In this section the old railway line had to overcome difficult terrain, as is evidenced by an abundance of major earthworks and other railway structures. 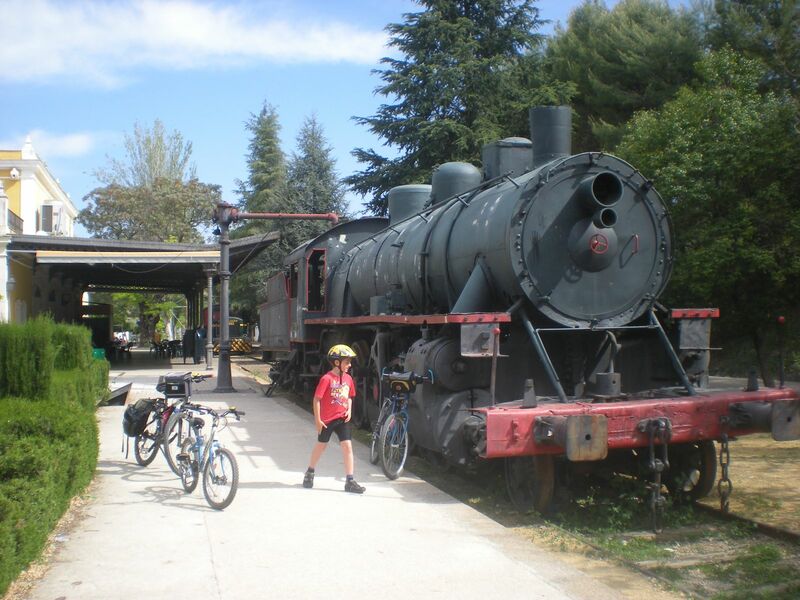 Cabra station and its main building have been restored to a restaurant a house the Olive Oil Train Interpretation Centre, which provides basic information about the old railway, the Greenway, and the rural district of La Subbética. Visiting is a must. Near here there is a parkin caravan aera. We leave Cabra and return to a landscape of olive groves where we make our way through an especially tranquil countryside to the viaduct over the Barranco del Alamedal. (Km 93). On the far side we move into an area of vineyards as we approach the town of Lucena. At the height of the Tourism and Leisure Center of Lucena station (Km 98.7) you can make a stop in the recreational area that is equipped with a playground and a restaurant. We leave Lucena station and after crossing over the A-318 road over a newly built footbridge, and over various roads we take our leave of the town through an industrial area parallel to the Cordoba road. After a gently winding descent punctuated by a number of metal bridges over water courses or rural roads we reach the last station on our route, Moriles-Horcajo. 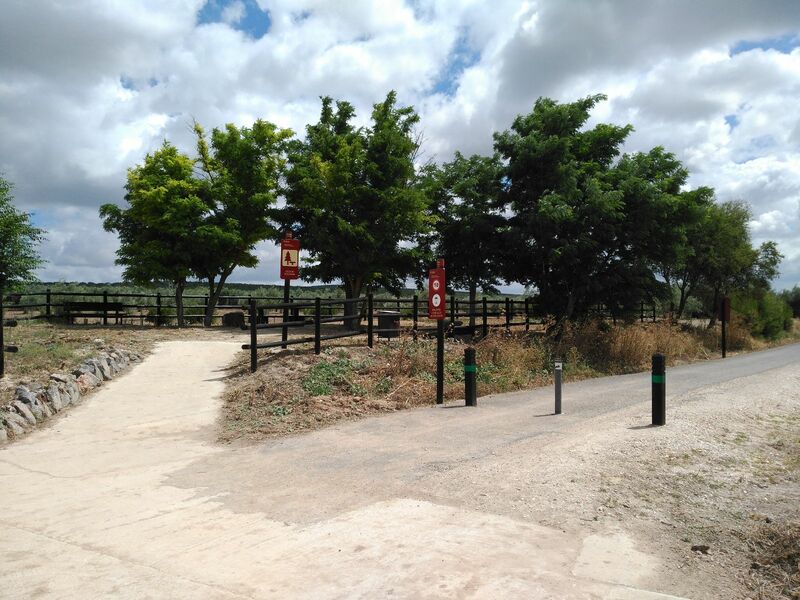 Thanks to the refurbishment of the Ministry of Environment in 2012 was recover the last 7.8 km railway platform, and runs from Las Navas del Selpillar, in the municipality of Lucena, to the abandoned railway town of Campo Real, the last one of the path, located 4 km from Puente Genil town. Beyond kilometre 112 and the end of the Subbética Greenway, just where there is a rest area and the start of the Lagares de Moriles Route (10.7 km), this final stretch runs behind a slope on which young pine trees, corn gromwell and rosemary grow, before crossing a farm track and the Fuente Romero stream. A short while later we reach the only rest area on this section which is on a raised area to our right, next to the junction with a road called Vereda del Cuquillo (which, if we turn left on to it, takes us to the A-318 motorway. A few metres away on our left, if the season is right, we can enjoy a large plantation of sunflowers (Km 2), from where we can see the large red footbridge spanning the A-318 and, beyond that, the heights of the Sierra del Castillo, topped by the single remaining tower of the mediaeval Anzur Castle. 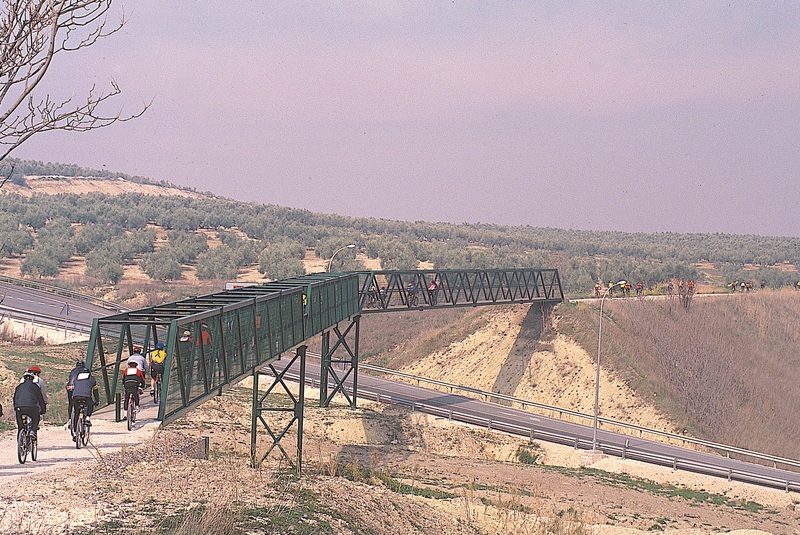 A few metres further on we cross over the aforementioned footbridge which provides an artificial viewpoint from where we can gaze across vast expanses of olive groves. 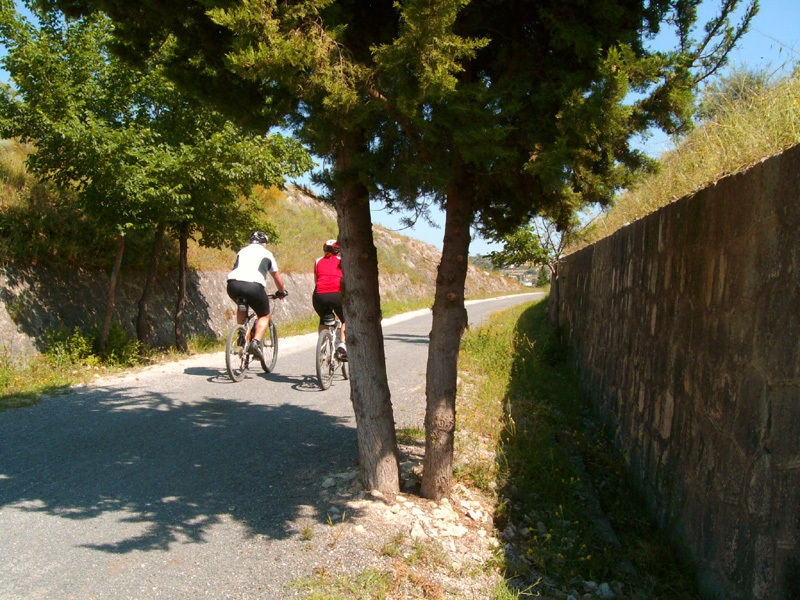 The route between kilometres 116 and 117 passes between slopes overrun by rabbits that scamper away as we pass down a green corridor flanked by oaks, almond trees, cane and, a little closer, wooden railings. Here we should be able to spot red-legged partridges, red kites, and Montagu's harriers, while to our left we pass an example of a typical Andalusian farmhouse, the Cortijo de Monte Caicedo. Soon, water level permitting, we will ford the Arroyo Navaluenga stream. Approximately one kilometre later, just before kilometre stone seven (Km 119 of the route), we come across the only railway hut still standing in this section. Shortly, an oleander-lined section tells us we have reached the end of our route. On our left, peeking out from between some towering eucalyptus trees, is the industrial chimney stack of the Cortijo de Santa Elena, an example of the region’s oil producing heritage, and to our right is Campo Real. Of this former railway town only six ruined buildings remain, among them Campo Real station, past which runs the active Cordoba to Malaga railway line. This area is protected by a metal fence and provides a car parking area that can be reached via the CO-6223 road off the A-318 motorway. From here, by following the signs recently erected by the town council, we can embark on another 6 kilometre route to reach the town of Puente Genil. 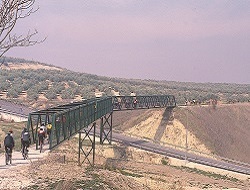 This town is connected by rail, which means that both ends of the longest greenway in Andalusia, Jaén to Puente Genil, can be reached by train. Another conflict, the Spanish Civil War, briefly breathed new life into the railway for strategic reasons; the line provided an alternative to the frequently bomb damaged Espeluy-Sevilla line. But when the guns fell quiet, so did the locomotives, which became an increasingly rare sight on the line, and when they did run it was at the breathtaking average speed of 30 km/h!. 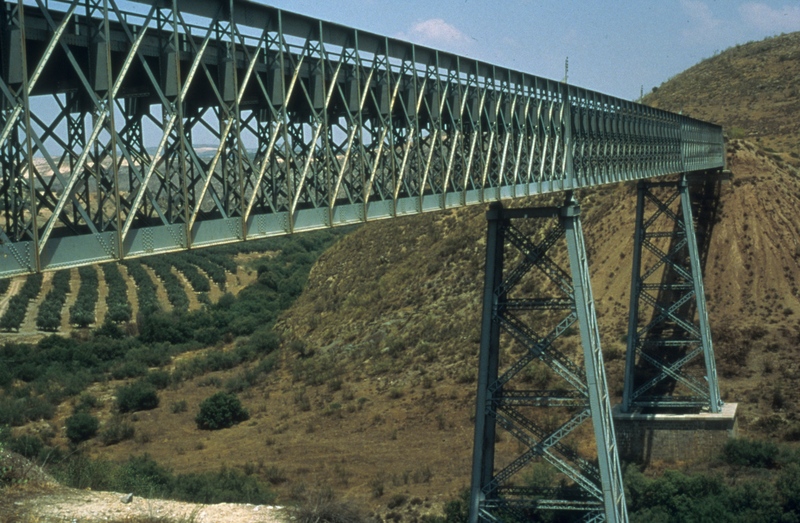 The railway remained in this precarious situation until 1985 when the entire section between Jaen and Puente Genil was closed down, along with hundreds more kilometres of line all over Spain. 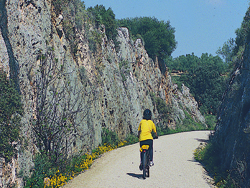 Fifteen years on, machines of another kind ran along the ballast rail bed to convert it into the magnificent Greenway of the Jaen province section once the necessary work had been completed by the Ministry of the Environment. 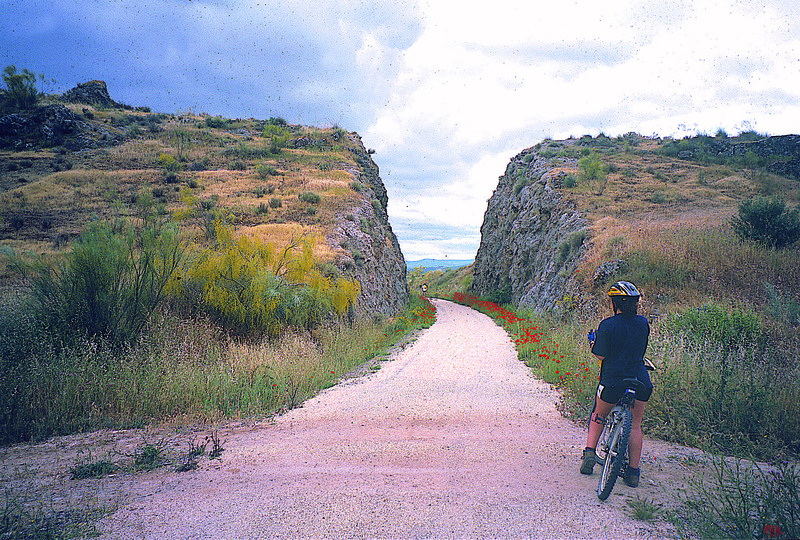 Later, the Cordoba province section was also recovered, the final part of which, from Lucena to the station at Campo Real, was commissioned as a greenway in 2011. 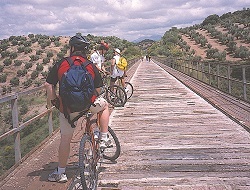 And a little after that the spur line from Baena was developed as a greenway by the town council of this Cordoban town. Telf.. 957 670 110. (Concerted visit). Telf.. 957 692 215 (Concerted visit). Telf. 957 670 225 (Concerted visit). Iberian wildlife reserve. Environmental education workshops. Cheese factory, restaurant and shop "Los Balanchares"
Cycle rental and guided tours. Visits to the winery by appointment. Cycle rental and transport. Hiking. Guided tours, cultural space management, learning activities. Spa. Thermal circuit. Arabian baths. Visit to the winery and tasting. Olive oil tasting and visit to the cooperative. Winemaking Cooperative la Purísima S.C.A. Hacienda Fuente de la Salud. San José Eve. 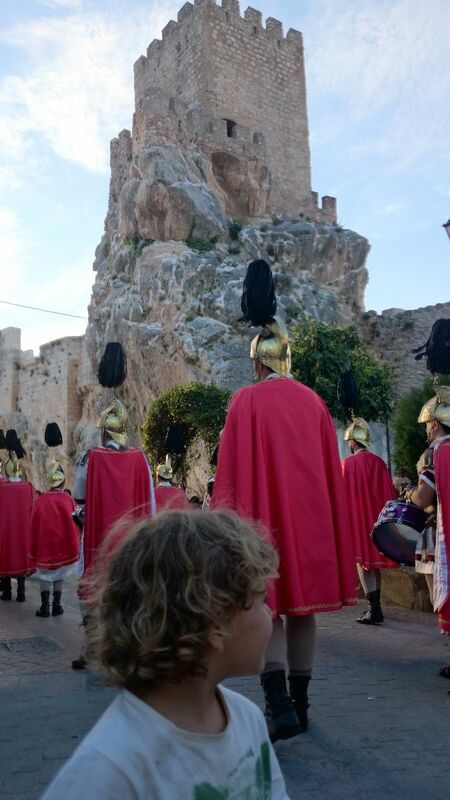 Touch of thousands of drums through the streets of the town. 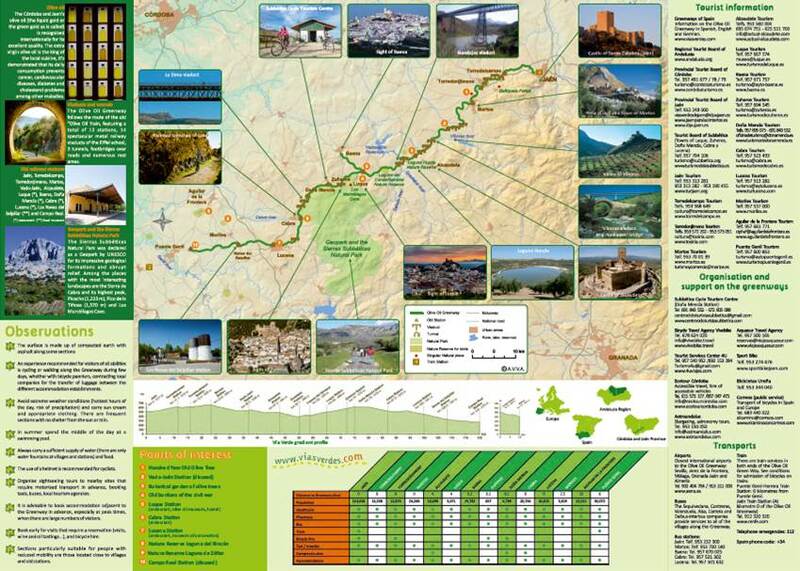 Information about accommodation, routes, villages, gastronomy, festivals, and cultural events of the province of Jaén. The Olive Oil Greenway is a gentle route, some 128 kilometres long, which takes us either on foot or by bicycle to the heart of the two great olive oil producing provinces, Jaen and Cordoba. 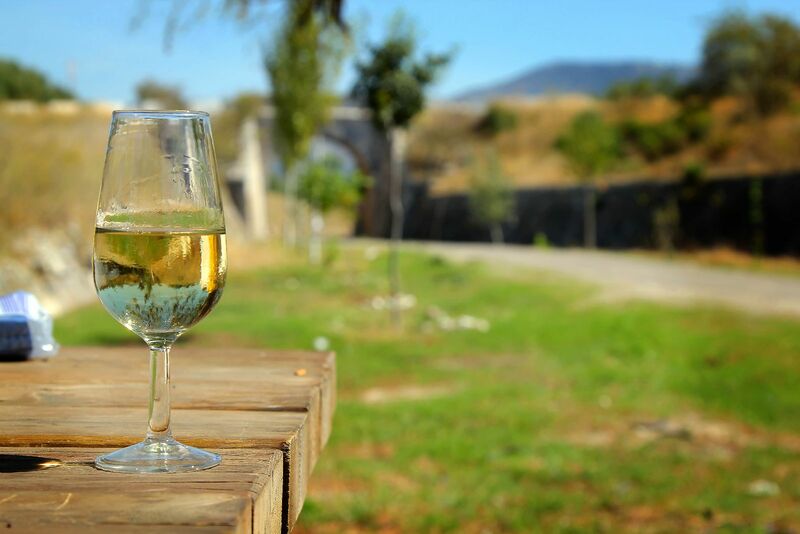 Disused 19th century railway viaducts now give us the opportunity to move effortlessly through a sea of olive trees and the mountainous landscapes of the Sierras Subbéticas Natural Park. 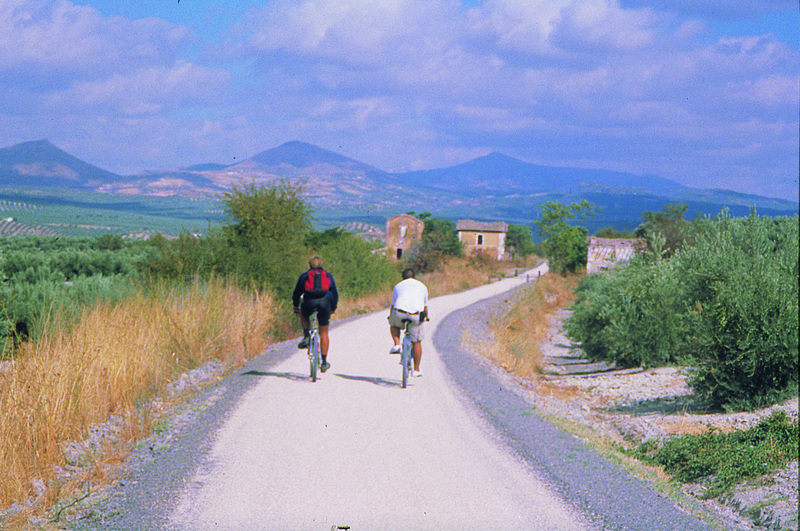 Our route takes us past old watchtowers, Andalusian farmhouses, and disused railway stations now providing new tourism services, all the time attended by hospitable locals.